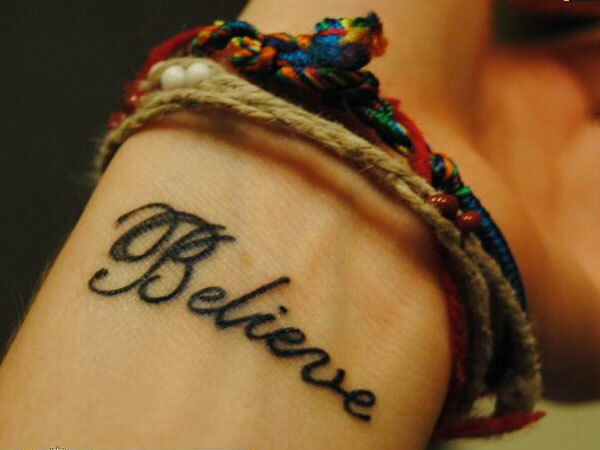 ‘Believe’ is such a simple word yet it packs in so much of meaning. One word can change the destiny of a person and transform their lives into something pure, fresh,and rich. The universe has powerful energy flows that we can tap for ourselves to enrich our lives, but only if we believe. It can be a belief in the love of God, it can be a strong belief in the power of love, or it can be that deepest core belief, to believe one’s own self. Tattoos, one of the oldest forms of body art celebrate the beauty and magic of belief. 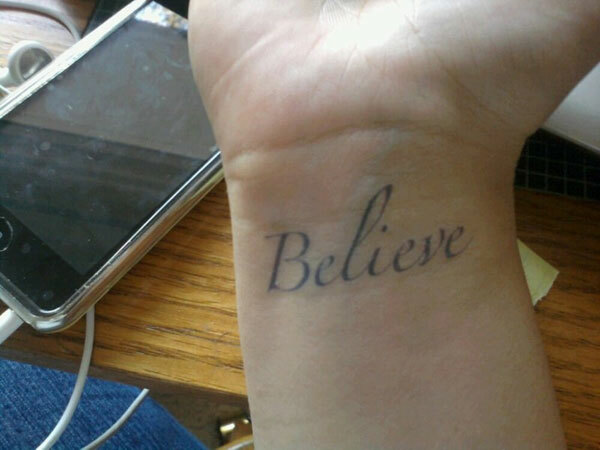 When it comes to ‘Believe’ a simple word tattoo has enough power to carry you through a lifetime. Many people get inked with Believe tattoos on their wrist to remind themselves to believe in love, beauty, and goodness everyday. With so much of positive energy surging through the universe, stars, butterflies, and vines can be the perfect decorative patterns to color a ‘Believe’ tattoo. A simple underlined stroke, flourishes and loops in key letters, or a pretty pattern of stars can be ideal to complete a Believe tattoo. Often you may find the word tattooed alongside other positive inspiration words on the side of a foot. 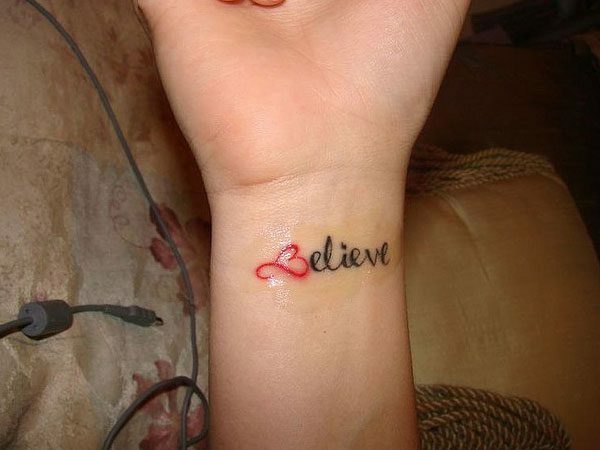 The word ‘Believe’ can also combine with a red heart or musical notes to make interesting patterns. You can also celebrate the magic power of self-belief with a neat red heart to replace the dot of the ‘i’ in a Believe tattoo. 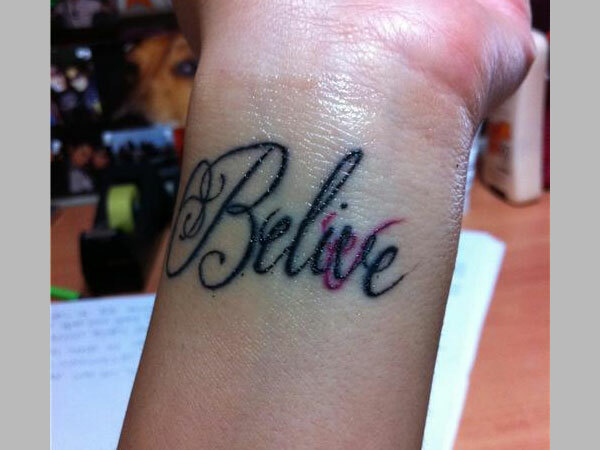 Continue to believe in beautiful designs as you look at these lively Believe Tattoos. If you like this article, you might be interested in some of our other articles on One Word Tattoos, Life Death Tattoos, Tattoo Sayings and Let It Be Tattoos. 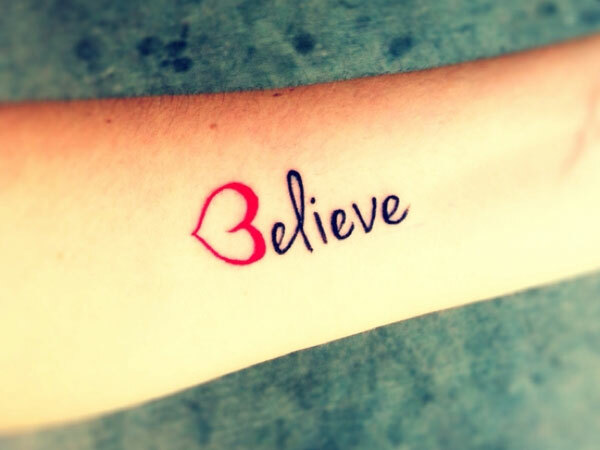 A red heart-shaped ‘B’ marks the powerful beginning of a love tattoo saying ‘Believe’ on the wrist. Two little stars right after the ‘e’ make this a unique Believe tattoo on the wrist. 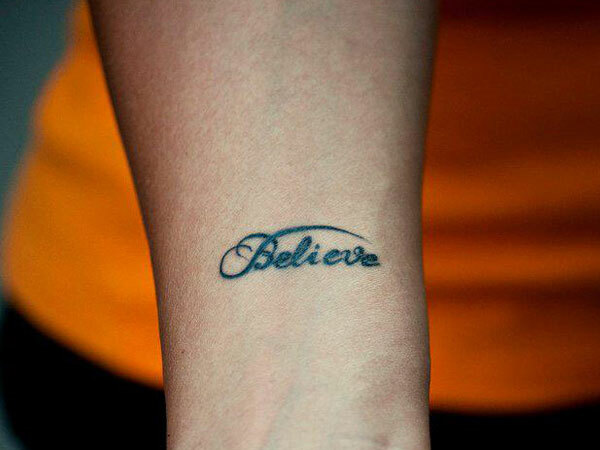 A loop each in ‘B’ and ‘e’ marks the beginning and end of this stylish one word tattoo. Italics and loops mark this retro style classy one word tattoo on the wrist. 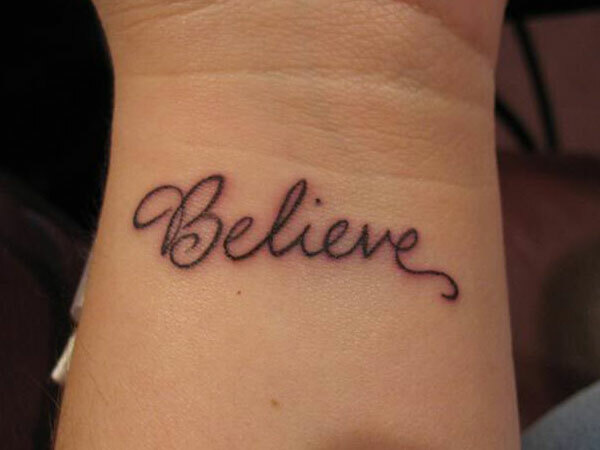 Done in a casual everyday font this simple wrist tattoo emphasizes the power of continuing to believe, every moment. Styled in a mass of loops and curls this is a pretty word tattoo in black ink for a girl’s foot. 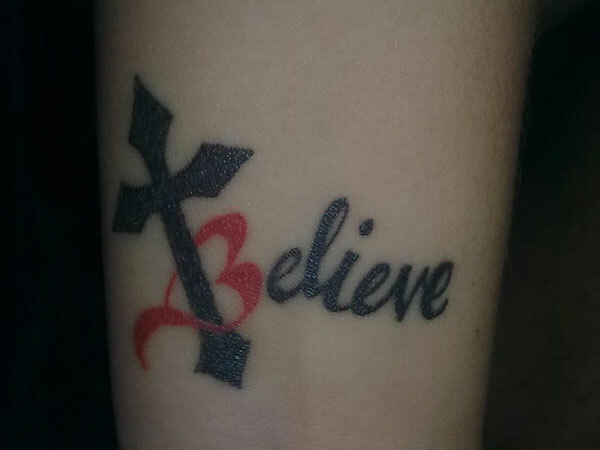 The cross right through the red heart in this Believe tattoo makes it a powerful showcase for religious belief. 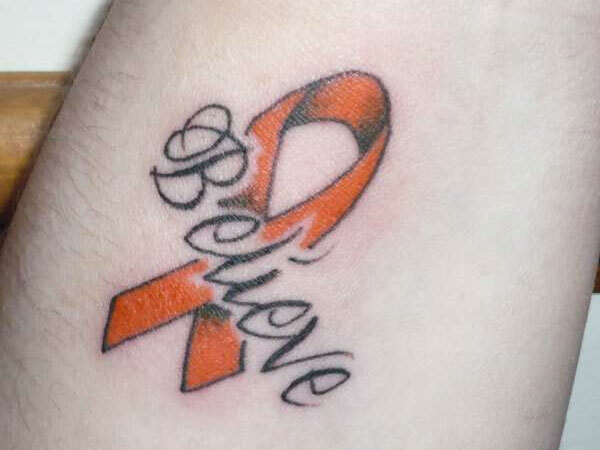 The red ribbon that symbolizes AIDS and the word ‘Believe’ come together to make a powerful message in this tattoo design. 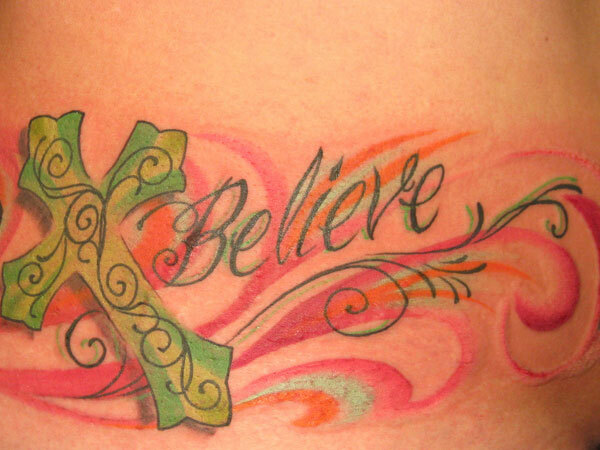 An artistically inked cross comes together with a colorful wavy pattern in this Believe tattoo. 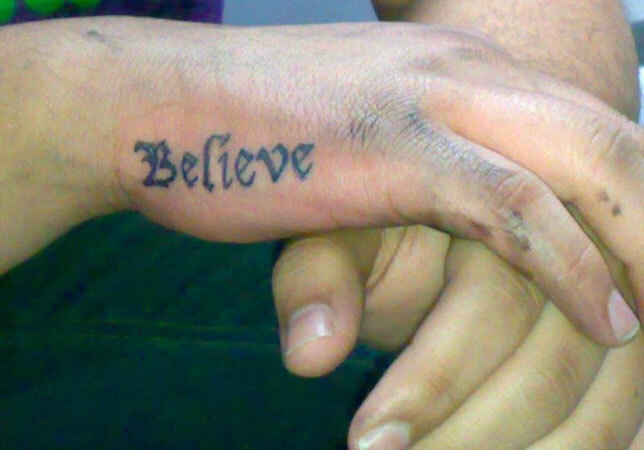 The side of the palm with its long shape makes for a great place to get inked with the Believe tattoo. 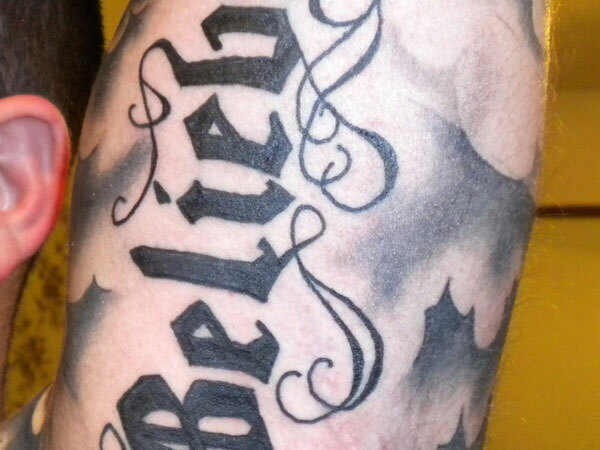 Inked in uniform letters in an italics style this is an elegant Believe tattoo in black. 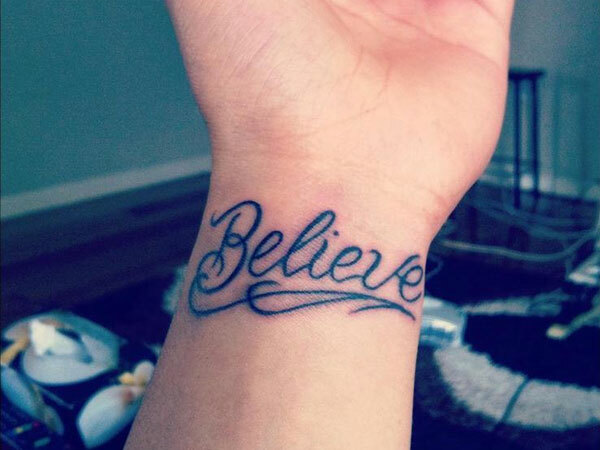 The ‘B’ is styled with a huge flourish to add a touch of drama to this simple Believe tattoo on the wrist. 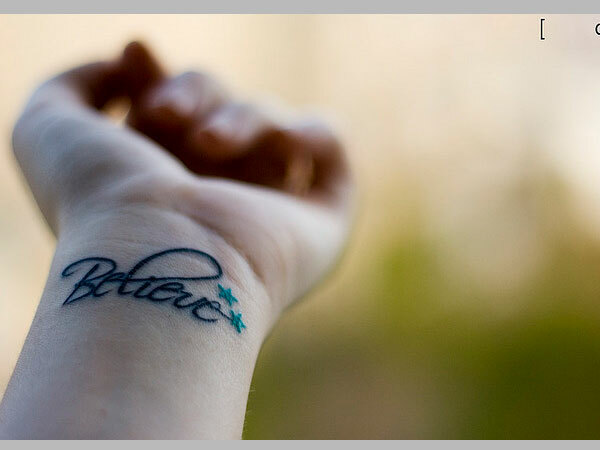 Believe in peace, says this elegant word tattoo inked in pure white on the wrist. 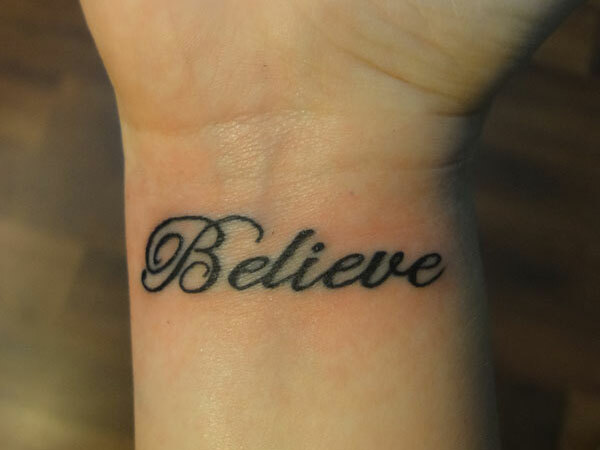 This Believe tattoo on the wrist is inked in a strong font and underlined with a flourish for a bolder effect. 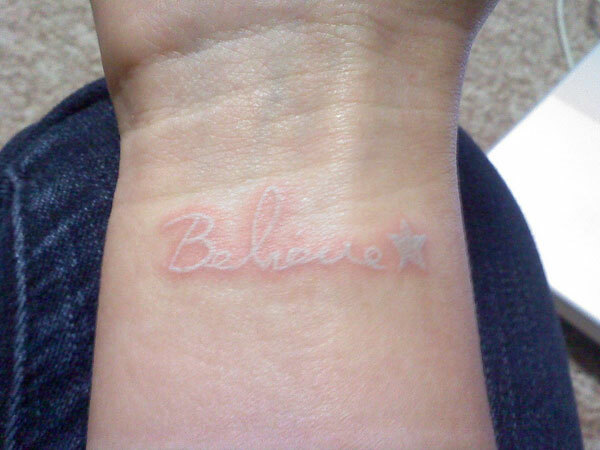 The ‘B’ shaped like a cute red heart is a pretty touch on this Believe tattoo. 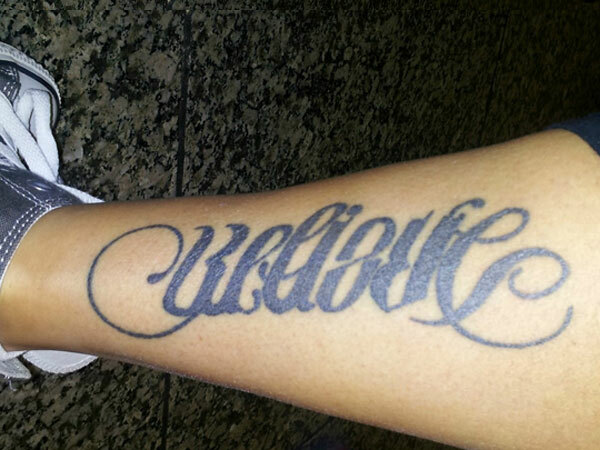 Strong lines in a bold font mark the letters of this Believe leg tattoo. 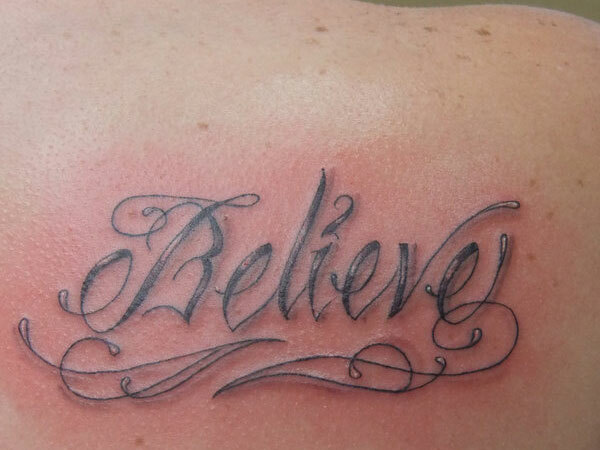 The strong swirls and loops add an old style classy look to this ‘Believe’ word tattoo. 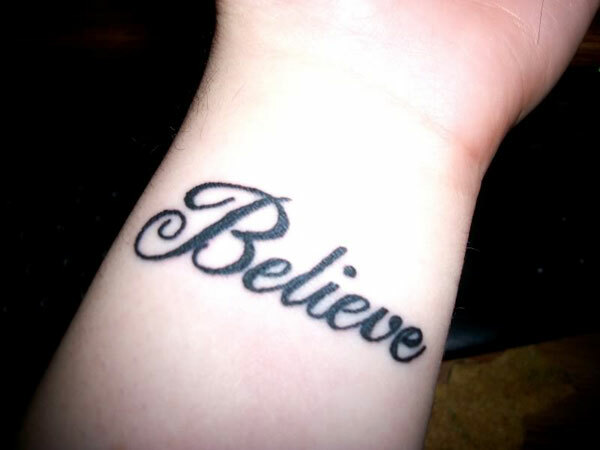 You can get the simple yet powerful word ‘Believe’ word on your wrist in a regular font to look at everyday. 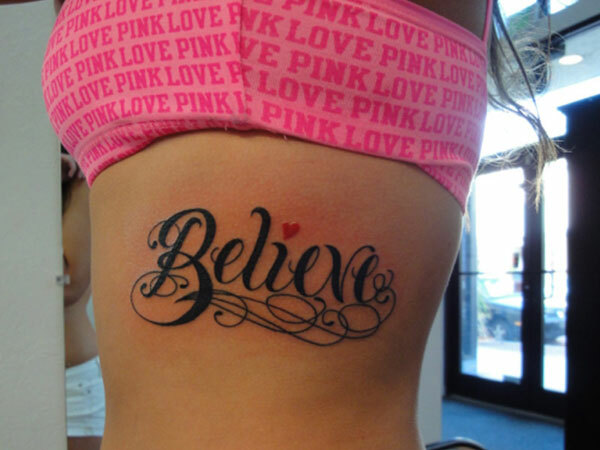 This elegant word tattoo in black ink has a pink touch for a colorful effect. 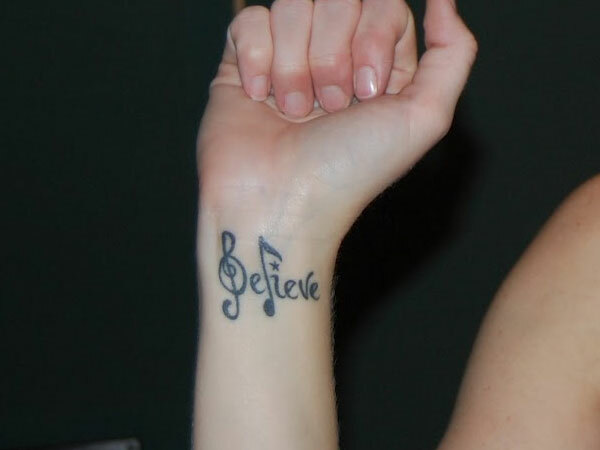 Believe in the power of music, says this tattoo that cleverly combines the ‘Belief’ word with musical notes in the design. 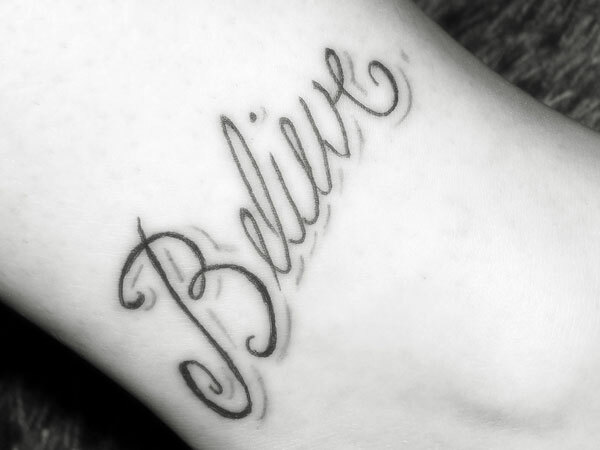 The side of the foot is long enough to get an elaborate Believe tattoo in a formal font. 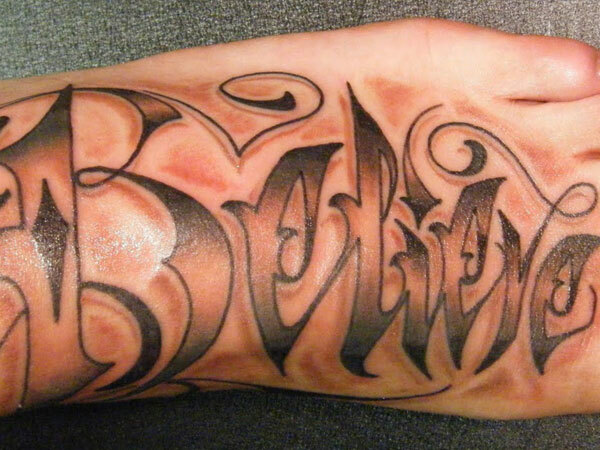 Strong angles and straight lines add power to this graphic design style Believe tattoo. 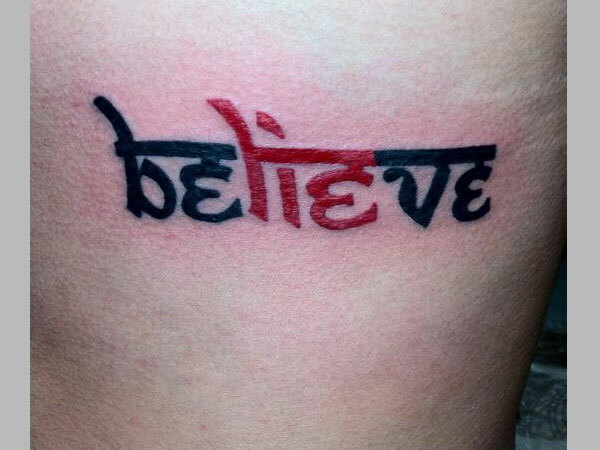 Red and black combine dramatically in this word tattoo written in a small hand. 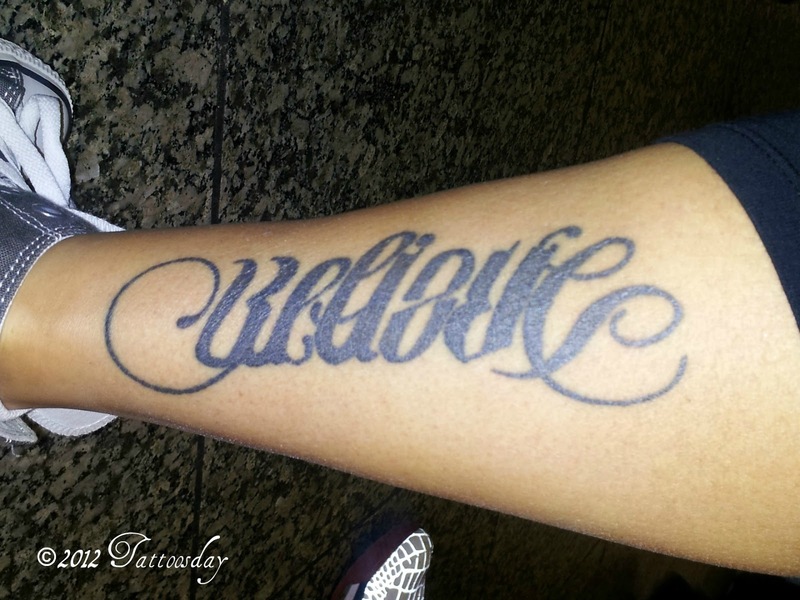 Orange shades and stylish spikes mark this elaborately styled word tattoo on the leg. 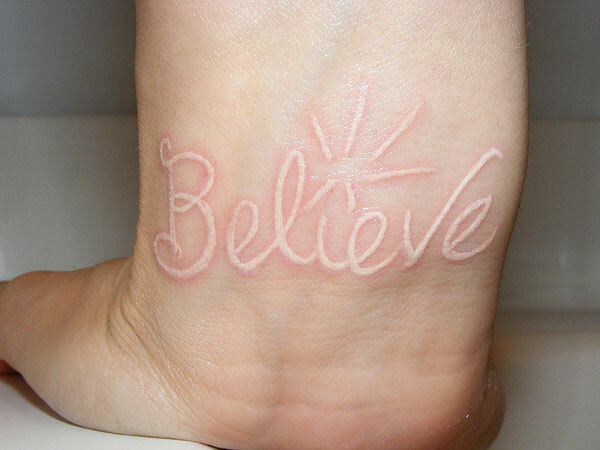 Inked in pure white this is an elegant ‘Believe’ tattoo to showcase on one foot. The patterns of spring bloom in eternal combinations in this beautiful Believe tattoo with stars and butterflies for decoration. 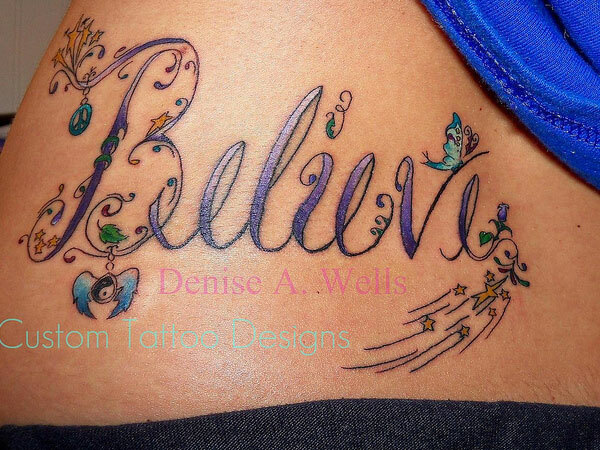 Colorful patterns of stars, a butterfly, and pretty vines add decoration to this Believe tattoo. 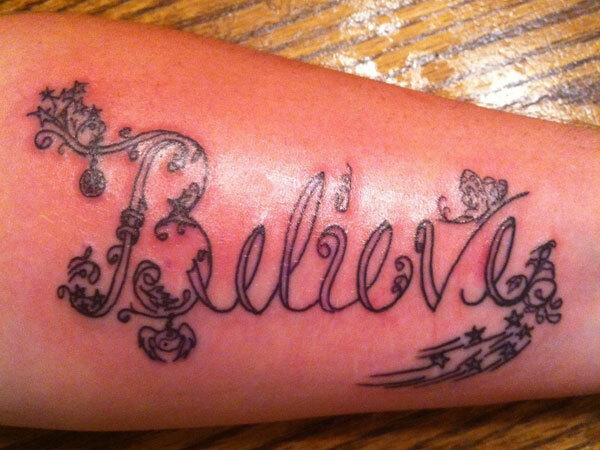 A rich pattern of curvy lines sits inked below this stylish Believe tattoo. A lighter shadow style repeats the flowing lines of this powerful word tattoo. 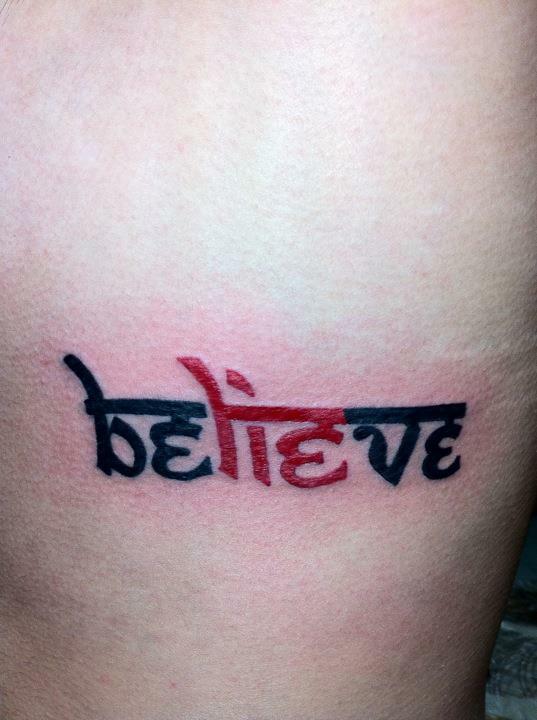 The lines of this Believe tattoo get a touch of drama from the elaborate mass of swirls and the red heart-shaped ‘i’. 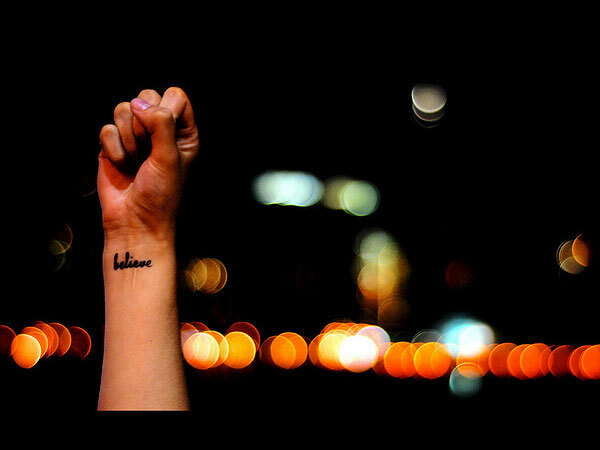 Inked in a small hand this simple tattoo in black sends out a powerful message to believe. 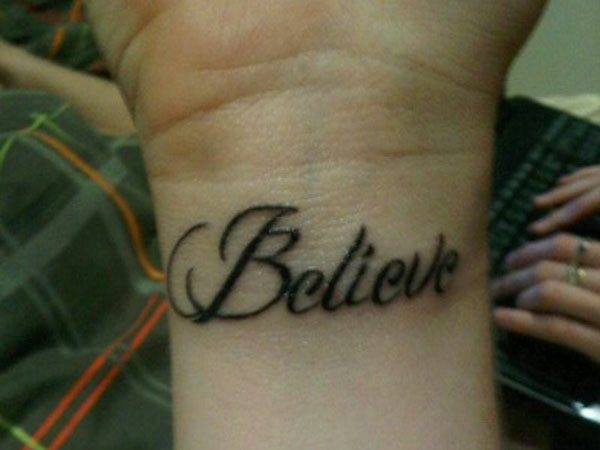 Note the fine line that finishes off this stylish Believe tattoo on the wrist. 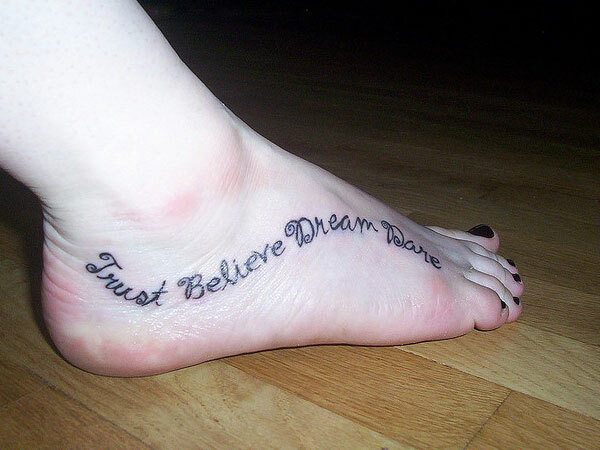 The word ‘Believe’ sits among other life affirming powerful words in this beautiful tattoo on the side of the foot. 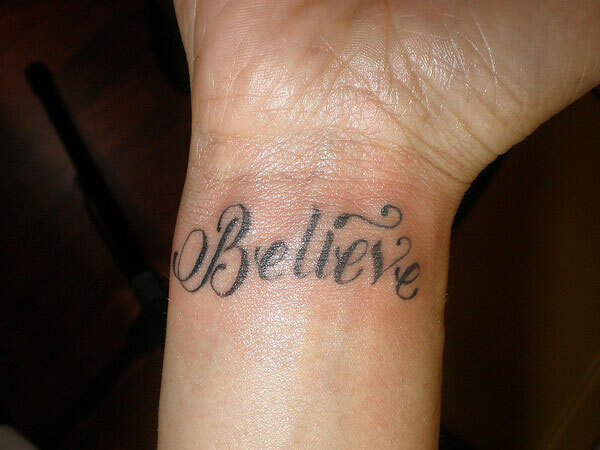 Inked in a flowing cursive font this narrow style Believe tattoo looks really elegant on the inner wrist. 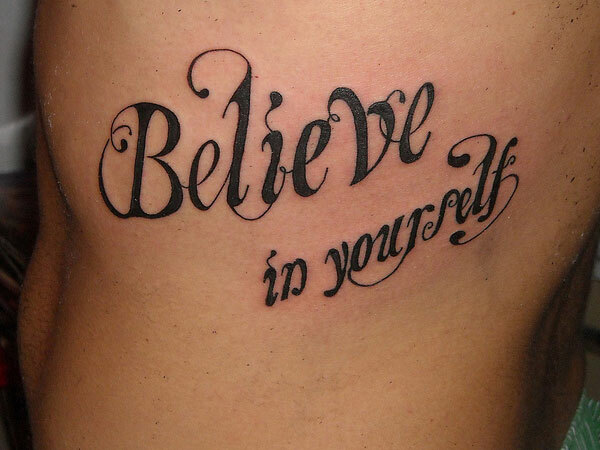 Styled in a strong cursive font this simple phrase tattoo is all about believing in one’s own self. 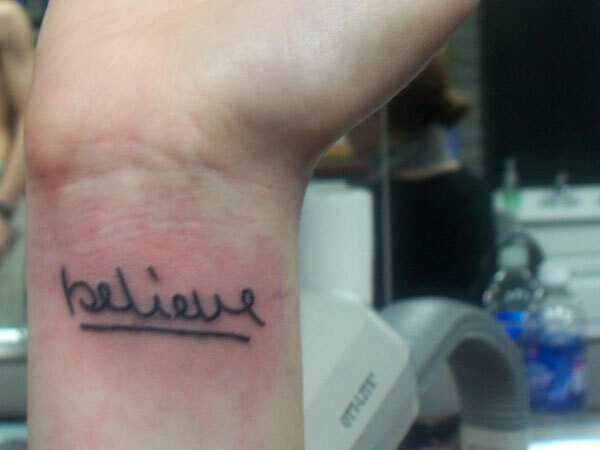 I’d like to have the Note To Self believe tattoo. That would boast self confidence. Very nice!